Annual mileage can be tailored to your needs. Ask for full details. 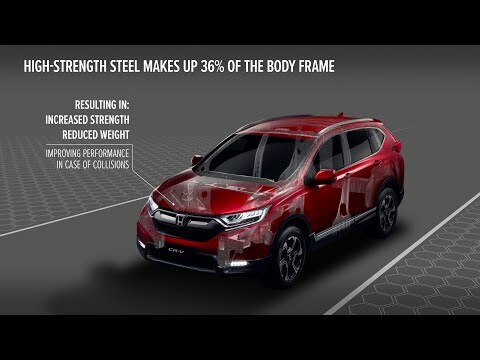 The New Honda CR-V has been designed and engineered to create an exciting, interconnected driving experience for driver and passengers alike. With its strong, signature exterior design and spacious, comfortable and practical interior, the CR-V confidently showcases Honda’s standing in the modern SUV market. The appearance of the CR-V is bold and athletic. Its powerful exterior shapes up impressively with raised, sculpted front and rear bumpers, without compromising on the new-age elegance given to it by the sleek lines on the bodywork. This design creates an efficient, aerodynamic airflow, whilst the 18” alloy wheels and exaggerated wheel arches further enhance its sporty presence on the road. Fuel-efficiency and driving stability are increased by the drag-reducing under-engine and underfloor cover, as well as the supportive rear spoiler. The interior of the CR-V has a very modern, sophisticated feel to it with premium features throughout. This starts with the front windscreen which has been narrowed to improve all-round visibility; in alignment with the state-of-the-art dashboard and ergonomic steering wheel. Quality upholstery and interior trim ensure maximum comfort for all on-board, whilst generous legroom and luggage space is afforded by the sizeable interior dimensions. The versatile rear seats come in a 60:40 split design, meaning they can be easily folded to create space for load items other than passengers, which add to the wide, deep boot space. The boot loading bay is supportively low, with the hands-free tailgate able to be opened by waving your foot under the sensor located on the bumper. The CR-V has a clear focus on inter-connectivity, adopting a variety of technological features to both support the driver and provide entertainment for all on-board. The Driver Information Interface (DII) has all of the vital statistics located on one convenient driver dashboard, whilst the steering wheel includes a host of useful buttons to access further information. The 7” touchscreen provides a full infotainment system – including radio, navigation and connection to your smartphone. Bluetooth, Apple CarPlay and Android Auto are all compatible through the touchscreen. There are numerous safety features in the CR-V, which support via radar and cameras to make both open-road driving and tight parking as easy as possible. Such features include Adaptive Cruise Control, Low Speed Follow and traffic sign recognition – all of which are centrally controlled by the driver. The exceptional driving performance of the Honda CR-V is powered by a 1.5L VTEC TURBO petrol engine. It is available in 2/4 Wheel Drive, manual or automatic transmission, and has the option of 5 or 7 seats. An i-MMD hybrid system is set to be launched in 2019.